Throughout GNJ, pastors aren’t the only ones leading worship on Sunday mornings. From musicians to lay leaders to multimedia assistants, the Doxology Worship Conference on Nov. 12 was geared toward all people involved in their churches worship. GNJ Director of Worship Eric Drew spearheaded the event that was held at Calvary Korean UMC in East Brunswick and brought in approximately 400 attendees. Featuring 12 workshops with eight different presenters and four learning tracks, the conference brought together both urban and rural churchgoers from all different ages. The idea behind the Doxology Worship Conference was to get the right resources to the right people, namely worship leaders. The word “doxology” which comes from the Greek “doxa” (glory) and “logia” (word or saying) is defined by Google as “a liturgical formula of praise to God.” With workshops for contemporary worship teams, traditional worship planners, preachers, multimedia teams, volunteers, small churches, and all kinds of musicians, participants left with practical learning in a continued expression of God’s glory. Kurtis Parks, Worship Director at National Community Church in Washington, D.C. was one of the conference’s lead speakers. National Community Church is a multi-site church led by pastor and New York Times best-selling author Mark Batterson and has a music team made up of nearly 150 singers and musicians who travel to churches and conferences alike, sharing their vision to see “global revival through personal worship.” Parks speaks to worship teams, and at various conferences about his desire to see passionate worship emerge in the church. Sonja Oftedal of St. Paul’s UMC in Bay Head was impressed by Parks’ message. “The scriptures supporting the means for praising our Lord Jesus Christ was a great reminder to our musicians that their efforts are essential and play an integral part in creating the worship experience,” said Oftedal. Rev. Catherine Williams, Associate Pastor of Pastoral Care at Princeton UMC led a workshop called “Finding Your Unique Preaching Voice” which attracted a dynamic, cross-cultural, multi-generational group of clergy and laity who were fully vested in the learning experience. Williams thought the event was well planned and executed and left encouraged by contagious energy. “It was just so wonderful to connect with clergy and laity across several districts,” she said. The practical and specific workshops were designed to offer something meaningful to all. Rev. Gina Yeske, Pastor of Simply Grace United Methodist Faith Community in Bloomsbury presented a workshop on small membership church worship. Yeske’s workshop highlighted the need for church leadership to take a close look at their local setting, their style and their values to determine if they were bringing their best to God in worship. The workshop concluded with a discussion of what a strong small church is. 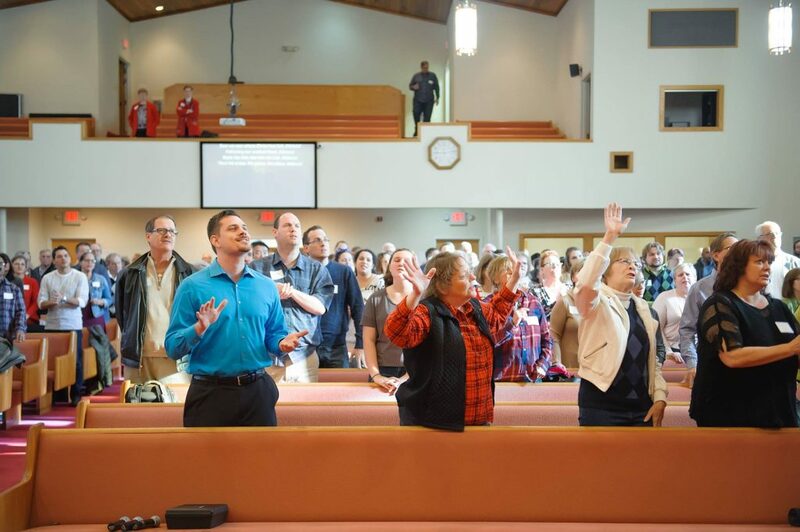 “Doxology was a well needed opportunity to recharge and refresh our passion for worship,” said Chuck DelCamp, producer of the contemporary worship service at Haddonfield UMC who coordinates with pastors and worship leaders to ensure a positive flow and worship experience. Additionally, he serves as the stage producer of the IGNITE youth conference. DelCamp was inspired by Drew’s challenge to never work alone. Both Lee and Drew agreed that one of the most powerful and moving moments of the conference was witnessing the gathering of diverse worshipers of different ages from across GNJ singing and receiving communion. Attendees left with practical next steps to take back to their churches.